1. December has arrived. The last month of the year. Christmas Eve is three weeks away. 2. It is amazing how life can turn on a dime. 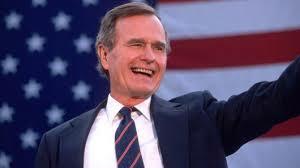 The passing of George H.W. Bush has really brought home how special life is and how one person can make a difference in the world. 3. The remodel on the basement continues. Yesterday the bathroom was completed with the installation of the light above the vanity. 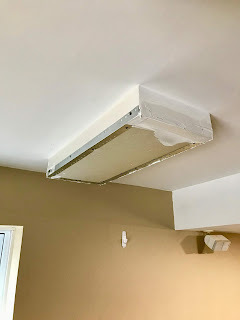 Work progressed on reconstructing the former frame that supported the range hood. I only have to get it mudded and then install two lights above the counter and the remodel will be complete, mostly. 5. There are 22 days until Christmas. 6. There was something enjoyable about 53 degree temperatures yesterday. Too bad it overcast all day. The forecast has 1-3 inches of snow for Saturday, brrrr. 7. Today in History. On this day in 1947, Marlon Brando’s famous cry of “STELLA!” first booms across a Broadway stage, electrifying the audience at the Ethel Barrymore Theatre during the first-ever performance of Tennessee Williams’ play A Streetcar Named Desire. In honor of the 41st President of the U.S., I will be providing a quote of his today. "In the wake of the Cold War, in a world where we are the only remaining superpower, it is the role of the United States to marshal its moral and material resources to promote a democratic peace. It is our responsibility, it is our opportunity to lead. There is no one else." —Jan. 5, 1993, West Point speech. Brakes, Why did it Have to Be Brakes?